Needless to say, I felt disappointed. Not only because I had hoped for some magic formula to make money but also because I felt that coming from the greatest investor the world has ever seen, this was too obvious a thing to say. Now I realise how wrong I was. The true meaning behind those simple looking words wasn’t as obvious as I had thought. The conventional wisdom in investing is that you just need to stay invested for a really long time in order to earn above average returns. While generally true, there are exceptions to this rule; exceptions which can be very costly. The chart compares the holding period return of equity vs. bank fixed deposits. Notice the years marked with a red arrow – 1992 and 2008. Had you invested a lump sum amount in those 2 years and held on till 2015, you would have earned a measly 8.50% and 8.65% respectively. Yes, that’s right. You would have done better had you invested in a fixed deposit. (That is not to say that you should be invested in fixed deposits instead of equity. Check this for a better perspective on why you should think beyond fixed deposits). Let’s concentrate on 1992 for a moment. 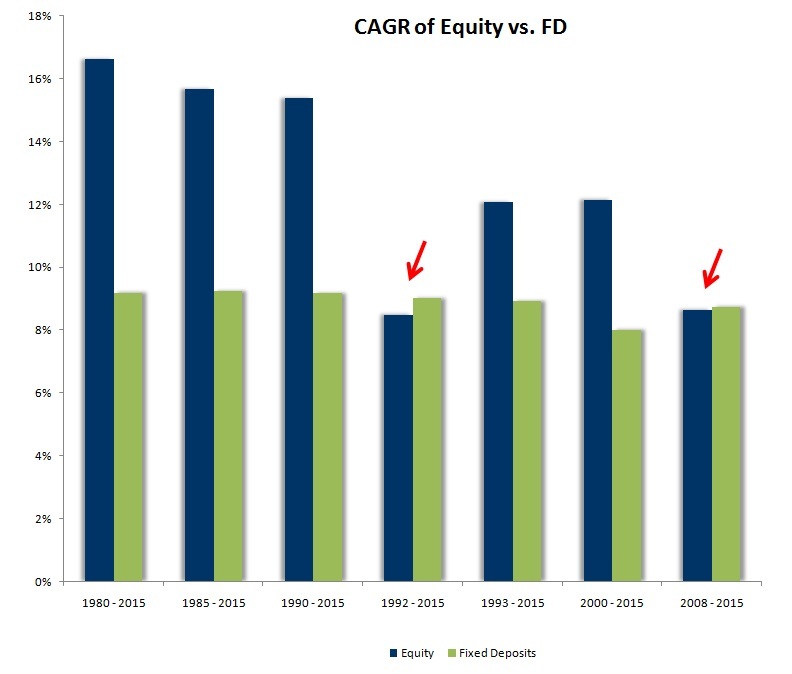 Even after 23 years, an investor would have underperformed FDs. That’s a bit of a jolt to say the least. And here is an interesting fact. Had the investment been delayed for just a year and made in 1993, the investor would have ended up with a 12% CAGR, easily outpacing FDs and inflation. So what is happening here? The huge difference in return is due to what happened in the year 1992. Markets fell almost 47% and the investment ended up trying to play catch up for the remaining 22-year period. Same was the case with the year 2008 when markets fell 38%. Now, as I mentioned earlier, these are exceptions, and that generally, equities would outperform fixed income. There is no denying that. But you cannot predict when you may fall victim to that exception. It is pertinent to note that when investing in the equity markets, wrong entry points can prove costly. One should try and avoid big negatives, because you may end up working your entire life trying to recoup those losses. What can an investor do to avoid such scenarios? As you can see, regular investments earned FD-beating returns in both those years – 12.30% and 13.60% respectively. They also easily beat lump sum investments in those years. Although regular investing lagged in a few of the other years, it always earned more than an FD. Given this analysis, the lessons become obvious. Rather, invest regularly (monthly, quarterly, etc.). Systematic investments may not give you the high returns of a lump sum investments made at the right time, but they also ensure that your entire capital is not invested at the very top of a market. 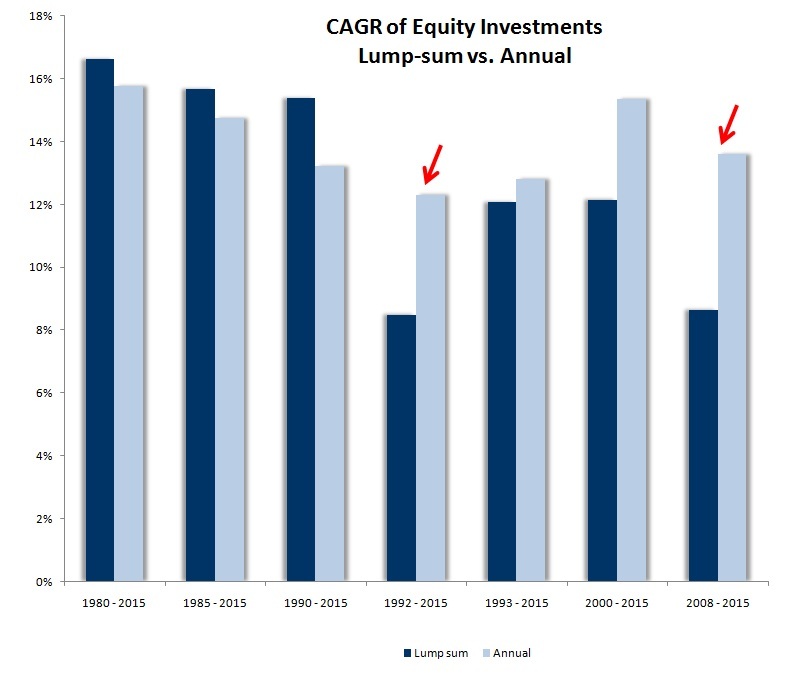 In the past at least, systematic investments have given FD-beating returns. If you keep the above tenets in mind, navigating the complex world of equity investing should become easier. Remember that despite their fluctuations, equity markets remain a great avenue for building long term wealth. Dividends have been ignored in the above calculations for the sake of simplicity. Historical fixed deposit rates: Reserve Bank of India – Handbook of Statistics on Indian Economy 2013-14. Note that fixed deposit rates for the years 2011-12 to 2014-15 have been assumed. Historical Sensex levels/ returns: Bombay Stock Exchange website.